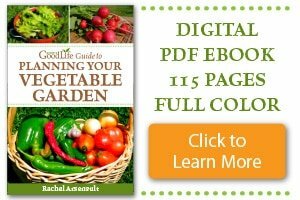 If you are growing an edible landscape, you may wonder how to take advantage of the shady spots near buildings or around trees. Shady areas in your yard may be the perfect spot to plant herbs. 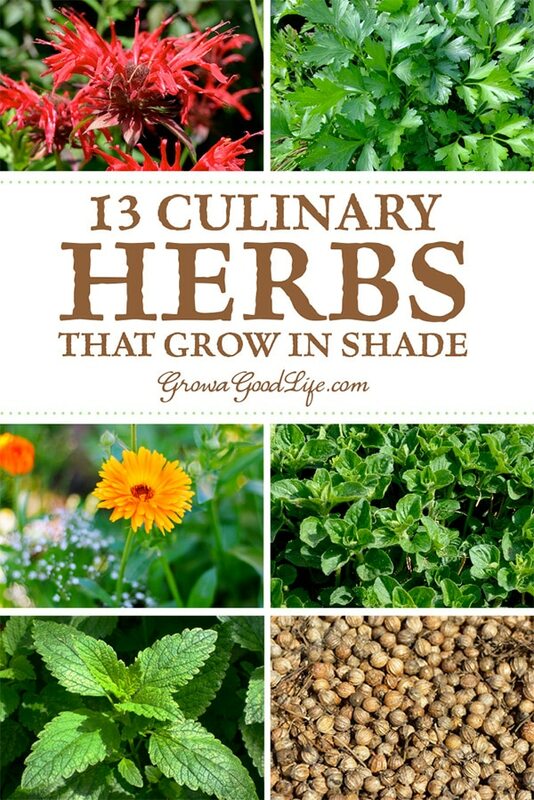 Here are 12 culinary herbs that grow in partial shade. 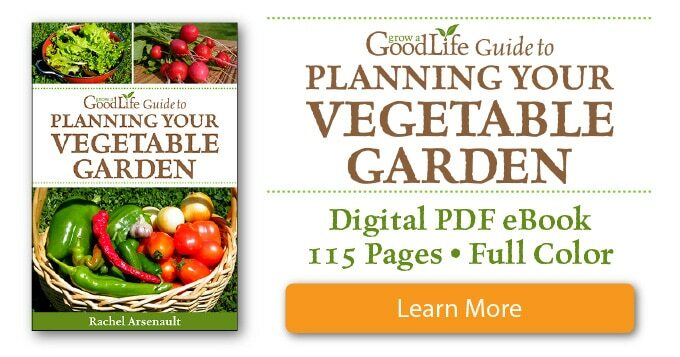 A vegetable garden provides plenty of fresh harvests for meals and extra to preserve for later. Flowers are fragrant, beautify our yards, and attract pollinators. While growing herbs give us the best of both. Herbs are fragrant, beautiful, attract pollinators, and serve further usefulness by also improving the flavor of food, providing medicinal relief for many physical ailments, and can be used for crafts and natural beauty products. Another bonus is, many herbs are perennials and come back every year without much fuss from us. Choosing herbs that are suited for partial sun or partial shade allows you to take advantage of shady spots in your yard and fill these areas with perennial herbs that will produce for many years to follow. The quantity of direct sun an area receives daily influences the types of herbs that will grow successfully. By choosing herbs that are suited for partial sun and partial shade you can make the most of shady spots and turn them into an herb garden. All plants need sunlight to generate nourishment through photosynthesis. Each plant needs different amounts of sunlight to produce a sufficient amount of food to grow and maintain health and vigor. Some plants need full sun, while others can do quite well with various levels of partial sun and partial shade. Understanding the difference between full sun, partial sun, and partial shade will help make the most of your area by selecting herbs that will thrive in different conditions. Full Sun is an area that receives at least 6 hours of sun per day and up to full sun all day. The 6 hours of full sun doesn’t have to be continuous the entire time. It can be broken up by periods of shade. For example, three hours of morning sun, followed by two hours of shade, and three hours in the afternoon. As long as it is direct, full sun. Partial Sun is an area that isn’t in full sun or full shade. Instead, it has some direct sun during the day amounting to 3-6 hours per day and is shaded the rest of the day. Partial Shade is also a space that isn’t in full sun or shade. Instead, it is defined as receiving 2-4 hours of sun with moderate shade the rest of the day. A partial shady area can also be described as a spot that receives filtered or dappled sunlight all day. Dappled sunlight is where the light is filtered through the leaves of trees. Full Shade is an area that doesn’t receive direct sunlight at all. However, in gardening terms this means less than 2 hours of sunlight a day. Keep in mind, sunlight fluctuates through the growing season as the position of the sun moves, changing the day length throughout the growing season. So use these as a guideline, rather than the rule. Don’t be afraid to experiment with your herb plantings. Most herbs can be dug up and moved if they are not happy in a particular spot. 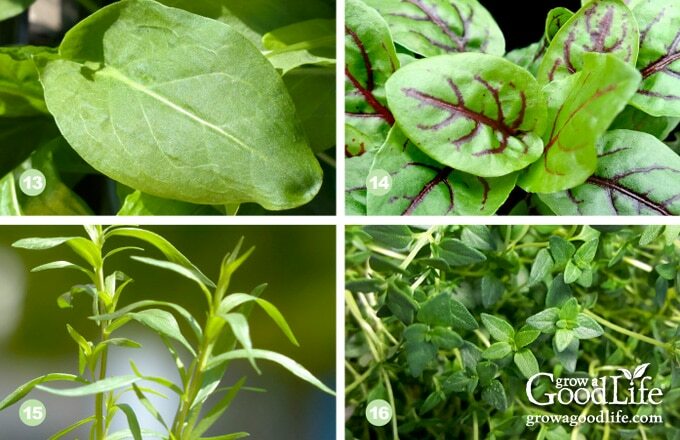 Here are herbs that will grow in partial sun and partial shade. Bee balm (Monarda didyma) is a perennial plant that serves double duty in the herb garden. Its bright showy blooms are attractive and draw many beneficial pollinators. The foliage of Monarda didyma has a minty sage and oregano blended flavor making it a nice compliment to roasted meats and wild game. The petals are milder in flavor and can be tossed into both leafy and fruit salads to add a bit of spice and a burst of color. Hardiness: Zones 3-9. Sun: Soil: Bee Balms prefer moist soil that is rich in organic matter. The foliage is susceptible to powdery mildew, so plant in an area with good air circulation. How to Grow: Sow seeds, plant purchased transplants, or divisions. Harvest: Clip the base of the stalk and pluck the leaves and petals from the stalks. Dry the leaves for tea or to use in roasts. Common chives (Allium schoenoprasum) are perennial herbs will tolerate growing in partial shade. The amount of blossoms may be reduced, but the foliage’s flavor is all there. The mild onion flavored foliage compliments many dishes of different cuisines. The orb-shaped lavender blossoms that bloom in the summer are also edible and attractive to beneficial insects. Hardiness: Zones 4-11. Sun: 4-6 hours. Soil: Chives grow best in rich, well-drained soil. Work in a slow-release fertilizer into the soil before planting. How to Grow: Start from seed, plant purchased transplants or divisions. Harvest: Choose leaves from the outside of the plant and cut 2 inches from the soil as needed. Calendula (Calendula officinalis) is a hardy annual also known as pot marigold. Calendula produces colorful yellow and orange blossoms that provide a bold burst of color and attract pollinators. Calendula plants bloom more abundantly in full sun, but will tolerate partly shading areas. The flower petals are edible and have a spicy taste that compliments soups and salads. You can also use the dried flowers to make tea. Sun: 4-6 hours. Soil: Calendula isn’t fussy, but will appreciate good quality garden soil especially if growing in partial shade. How to Grow: Sow seeds directly in the garden in early spring or late summer for fall color. Harvest: Harvest blossoms at full bloom and pluck petals for culinary use. Sun: 4-6 hours. Soil: Chervil prefers cool soil enriched with compost. 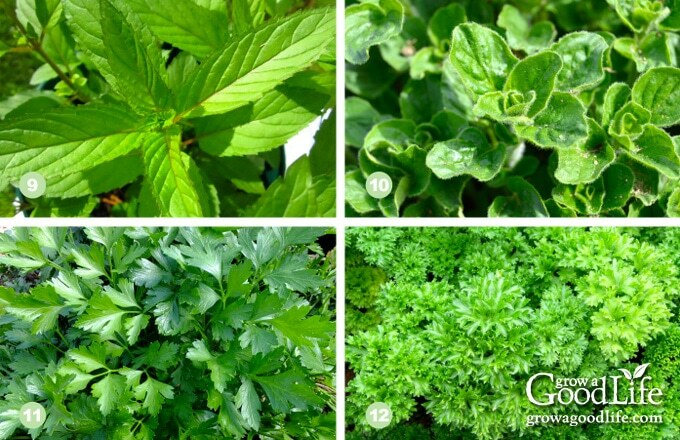 How to Grow: Chervil will produce more foliage in the cool seasons. Chervil grows quickly from seed within 6-8 weeks. Direct sow seeds in the garden in early spring, and then succession sow seeds in 4 weeks for a continuous harvest. Sow again in late summer for a fall harvest. Harvest: Begin cutting foliage as needed from the outside of the plant once the plant is 4-inches tall. 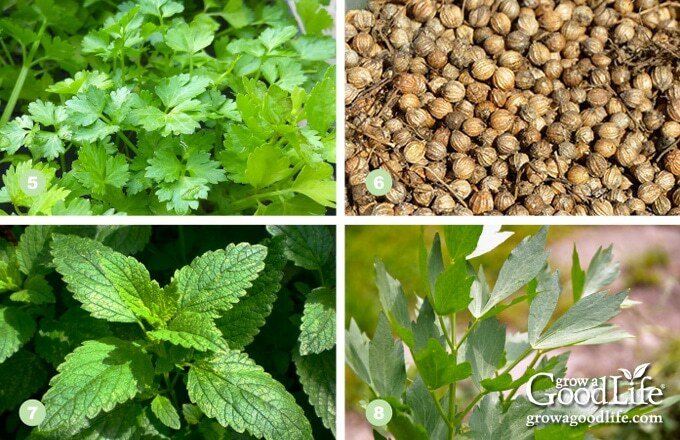 Cilantro / Coriander (Coriandrum sativum) is an annual herb that grows and matures quickly. It’s a cool season herb, so it will appreciate some shade when temperatures increase. The leaves are called cilantro, and the seeds are called coriander. The leaves pair well with Mexican, Asian, and Indian foods while the crushed seeds adds a mild earthy lemony flavor when added to curries, soups, and stews. Sun: 4-6 hours. Soil: Cilantro prefers well-drained loamy soil rich in organic matter. How To Grow: Direct sow seeds. Cilantro doesn’t respond well to transplanting. Harvest: Once plant is 4-inches high, snip fresh leaves from the outer edges allowing the center of the plant to continue to produce. After cilantro flowers, coriander seeds can be harvested when they turn brown. Lemon Balm (Melissa officinalis) a perennial herb that produces clumps of lemon scented leaves. Use lemon balm in place of lemon in your favorite recipes. Add a few leaves to your leafy green salads and fruit salads. Lemon balm adds lemony flavor to salad dressing and marinades. Use fresh leaves to flavor teas and summer drinks. Hardiness: Zones 5-9. Sun: 4-6 hours. Soil: Lemon balm will tolerate a variety of soil conditions, although it prefers rich, moderately moist soil. How to Grow: Sow seed, or transplant divisions, or purchased plants. Cut the plant back after it blooms and it will produce fresh growth. Harvest: Harvest before the plant blooms for the strongest flavor. Cut leaves and stems as needed throughout the growing season. Lovage (Levisticum officinale) is a tall perennial herb with green leaves and bright yellow blossoms that draw beneficial insects. The plant can reach heights of 6 feet. The whole plant it edible and tastes similar to celery. Use the leaves, stalks, roots, and even the seeds to flavor salads, soups, sauces, and stews. Hardiness: Zones 4-8. Sun: 4-6 hours. Soil: Loose, rich, loamy soil that retains moisture. How to Grow: Sow seeds or plant young transplants. Cut the flowers back after blooming for lush leafy growth. Harvest: Cut stems and foliage as needed throughout the growing season. Mint (Menta ssp.) 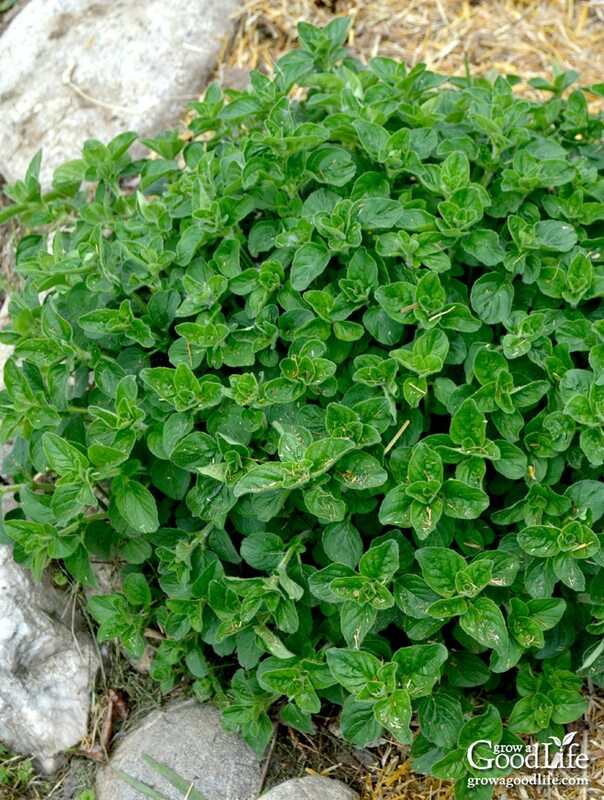 a perennial herb with a strong minty fragrance. There are a number of varieties with distinctive flavors, colors, and plant heights. The foliage can be used for teas, added to salads, and pairs well with sweet and savory dishes, including roasts, soups, and pastas. Hardiness: Zones 4-9. Sun: 4-6 hours. Soil: Mint isn’t fussy, but will appreciate evenly moist, rich soil. How to Grow: You can grow mint from seeds, but the flavor will vary. Start with a division from a friend, or a purchased plant so you can taste it first. Mint tends to spread, so consider giving it plenty of room or edge the plants to keep them contained. Cut stems back after blooming for fresh growth. Harvest: Cut stalks and strip leaves as needed throughout the growing season. Greek Oregano (Origanum heracleoticum) is a hardy perennial that is easy to grow. Oregano is generously used in Italian and Greek foods and pairs well with many other dishes such as stews, grilled meats, pizza, salads, and soups. Hardiness: Zones 4-9. Sun: 4-6 hours. Soil: Loamy soil that drains well. How to Grow: Grow from seed, purchase and transplant seedlings, or re-plant divisions from established plants. Harvest: Harvest before the plant blooms for the strongest flavor. Cut leaves and stems as needed throughout the growing season. Italian, Flat Leaf Parsley (Petroselinum crispum) is a biennial herb that is normally grown as an annual. Parsley pairs well with meats, salads, soups, and roasts. Curly parsley (Petroselinum crispun var. crispum is used mostly as a garnish, but also has lots of flavor. Hardiness: Zones 4-9. Sun: 4-6 hours. Soil: Rich loamy soil rich in organic matter to help hold moisture. How to Grow: Sow seeds or purchase young plants. Harvest: Snip outer stalks from the base of the plant and trim off leaves. Sorrel (Rumex ssp.) is a family of perennial leafy herbs with a tangy, acidic flavor. 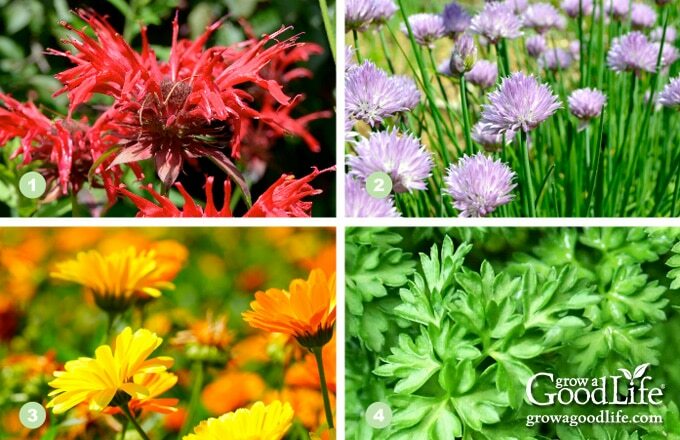 There are several varieties with distinctive flavors, colors, and plant heights. Toss young leaves into salads, soups, and sauces, or cook the leaves as you would spinach. Hardiness: Zones 4-8. Sun: Soil: Sorrel grows best in loose, well-drained soil rich in organic material. How to Grow: Sow seeds, plant from divisions or purchased transplants. Cut off the blossoms to keep the plants producing new leafy foliage well into fall. Harvest: Pick fresh leaves young and tender once the plant reaches 4-inches tall. French Tarragon (Artemisia dracunculus) is a perennial herb with bright green foliage with light anise-licorice flavor. Tarragon is a versatile herb and can be used to flavor meats, roasted vegetables, seafood, and sauces. Hardiness: Zones 6-8. Sun: 4-6 hours. Soil: Tarragon prefers a well-drained soil enriched with organic matter. How to Grow: French Tarragon does not produce seeds. Grow from a cutting, purchased seedlings, or division. Harvest: Cut stems as needed and remove the leaves from the stems by running your fingers down the stem from tip to base. English Thyme (Thymus vulgaris) is a hearty perennial herb that grows as a woody shrub with small, oval, gray-green leaves on long, wiry stems. The savory flavor of Thyme complements most meats, including chicken, beef, pork, and game. Hardiness: Zones 4-9. Sun: 4-6 hours. Soil: Thyme prefers a sandy, dry soil. Thyme is not a heavy feeder, so soil should only receive a moderate amount of organic fertilizer at planting time. Thyme is relatively drought tolerant once established. How to Grow: Start seeds indoors or purchase seedlings. Harvest: Cut foliage as needed leaving at least 3-inch (7.5 cm) stems to continue growing. Growing perennial herbs from seed is a great way to produce a lot of plants. Just remember, that you may have to wait until the second year to harvest. Perennial herbs come back year after year and filling your partially shaded spots is a great way to add edibles to your yard.